How does this work...I really am not getting it. I don't get the falling in love with a little girl halfwayaround the world that i've never even met part. 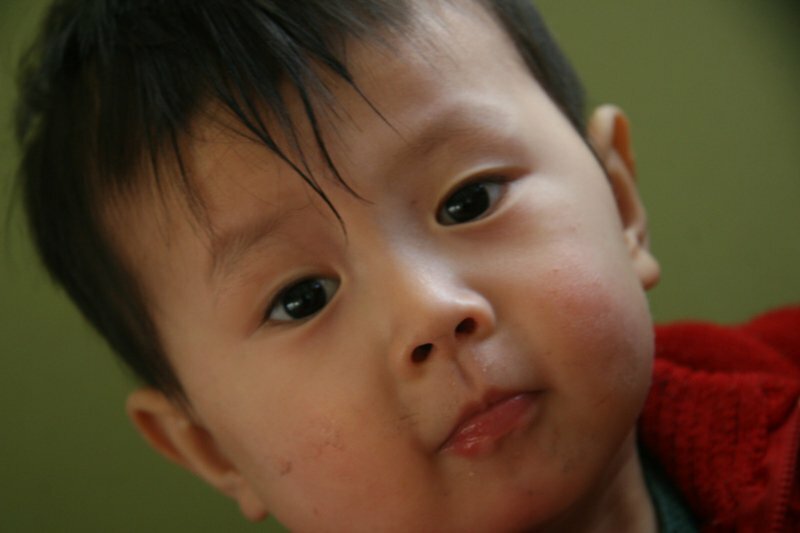 I don't get the part where the most beautiful precious four year old in China can be so sick. I don't understand how it was better for her to die. And I mostly can't figure out how it still hurts me. It's been almost 2 years since i met her. I looked at pictures. I sent her clothes and toys. I held her on my lap and let her play with my camera. I couldn't speak her language. I prayed my heart out for her. And wanted more than anything to hear her breath normal and walk easily. I wanted her to know the love of a family...and what it's like to run. I wanted her for mine forever. never got to send her for Christmas. And her face is still in my phone. I want to go back and double check that she's really not there...eating cucumbers and watermelon outside...watching the other kids play around her...yelling at them once in a while when they take her toy...then unsuccessfully trying to catch her breath. And then she'll look and see me and put her arms up to be held like she did before. The plan was for her to die. Now she knows love. Now she can run and dance and breath. Her skin isn't purple anymore. She's perfect. And when she puts her arms up to be held...Jesus will be there. And she'll be His...forever. Yesterday it was sunny and I found out I actually had most of the day off work. (*happy dance in the kitchen*) So I put on two sweaters and a hat and a coat and a scarf. And road my creaky ancient bike down to the beach and sat there eating lunch and reading C.S. Lewis. It made me feel pretty charming. I know it's long...but it's my favorite. And since I've read it about ten times you can take the time to read it just once right? It's chapter fourteen from The Screwtape Letters by C.S. Lewis. The book is a collection of letters from a 'senior' devil to his nephew, a 'junior' devil. So the 'Enemy' is God, and the 'patient' is Wormwood's current project--or human whom he is trying to damn. The most alarming thing in your last account of the patient is that he is making none of those confident resolutions which marked his original conversion. No more lavish promises of perpetual virtue, I gather; not even the expectation of an endowment of ‘grace’ for life, but only a hope for the daily and hourly pittance to meet the daily and hourly temptation! This is very bad. I see only one thing to do at the moment. Your patient has become humble; have you drawn his attention to the fact? All virtues are less formidable to us once the man is aware that he has them, but this is specially true of humility. Catch him at the moment when he is really poor in spirit and smuggle into his mind the gratifying reflection, ‘By jove! I’m being humble’, and almost immediately pride—pride at his own humility—will appear. If he awakes to the danger and tries to smother this new form of pride, make him proud of his attempt—and so on, through as many stages as you please. But don’t try this too long, for fear you awake his sense of humour and proportion, in which case he will merely laugh at you and go to bed. But there are other profitable ways of fixing his attention on the virtue of Humility. By this virtue, as by all the others, our Enemy wants to turn the man’s attention away from self to Him, and to the man’s neighbors. All the abjection and self-hatred are designed, in the long run, solely for this end; unless they attain this end they do us little harm; and they may even do us good if they keep the man concerned with himself, and above all, if self-contempt can be made the starting-point for contempt of other selves, and thus for gloom, cynicism, and cruelty. You must therefore conceal from the patient the true end of Humility. Let him think of it not as self0forgetfulness but as a certain kind of opinion (namely, a low opinion) of his own talents and character. Some talents, I gather, he really has. Fix in his mind the idea that humility consists in trying to believe those talents to be less valuable than he believes them to be. No doubt they are in fact less valuable than he believes, but that is not the point. The great thing is to make him value an opinion for some quality other than truth, thus introducing an element of dishonesty and make-believe into the heart of what otherwise threatens to become a virtue. By this method thousands of humans have been brought to think that humility means pretty women trying to believe they are ugly and clever men trying to believe they are fools. And since what they are trying to believe may, in some cases, be manifest nonsense, they cannot succeed in believing it and we have the chance of keeping their minds endlessly revolving on themselves in an effort to achieve the impossible. To anticipate the Enemy’s strategy, we must consider His aims. The Enemy wants to bring the man to a state of mind in which he could design the best cathedral in the world and know it to be the best, and rejoice in the fact, without being any more (or less) or otherwise glad at having done it than he would be if it had been done by another. The Enemy wants him, in the end, to be so free from any bias in his own favour that he can rejoice in his own talents as frankly and gratefully as in his neighbor’s talents—or in a sunrise, an elephant, or a waterfall. He wants each man, in the long run, to be able to recognize all creatures (even himself) as glorious and excellent things. He wants to kill their animal self-love as soon as possible; but it is His long-term policy, I fear, to restore to them a new kind of self0love—acharity and gratitude for all selves, including their own; when they have really learned to love their neighbors as themselves, they will be allowed to love themselves as their neighbors. For we must never forget what is the most repellent and inexplicable trait in our Enemy; He really loves the hairless bipeds He has created and always gives back to them with His right hand what He has taken away with His left. His whole effort, therefore, will be to get the man’s mind off the subject of his own value altogether. He would rather the man thought himself a great architect or a great poet and then forgot about it, than that he should spend much time and pains trying to think himself a bad one. Your efforts to instill either vainglory or false modesty into the patient will therefore be met from the Enemy’s side with the obvious reminder that a man is not usually called upon to have an opinion of his own talents at all, since he can very well go on improving them to the best of his ability without deciding on his own precise niche in the temple of Fame. You must try to exclude this reminder from the patient’s consciousness at all costs. The Enemy will also try to render real in the patient’s mind a doctrine which they all profess but find it difficult to bring home to their feelings—the doctrine that they did not create themselves, that their talents were given them, and that they might as well be proud of the colour of their hair. But always and by all methods the Enemy’s aim will be to get the patient’s mind off such questions, and yours will be to fix it on them. Even of his sins the Enemy does not want him to think too much: once they are repented, the sooner the man turns his attention outward, the better the Enemy is pleased. How cute is this? I missed his birthday though. I mean...I though of him...but I didn't send him anything. Fail. But I keep Mei Mei's last unsent Christmas present by my bed. I thought I would get over it and fall in love with another China baby. But I haven't. Yet.